Week Seven. Wow, this is a busy layout for me. But, I had fun with it. There are so many cute patterns, embellishments and doo-dads that I wanted to use so I just went for it this week. Obviously, you can tell that my Studio Calico "Sugar Rush" monthly Project Life kit finally showed up. It makes an appearance in the form of chipboard stickers, wood veneers and washi tape. Gah! 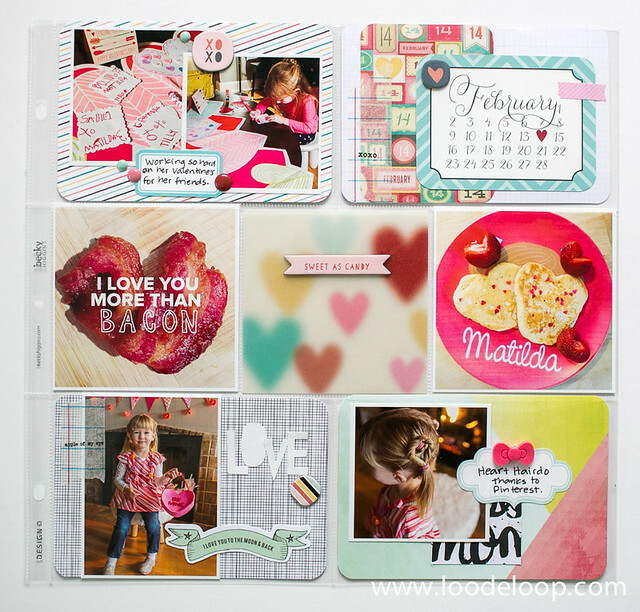 This adorable 3x4 heart pocket cut file from Deena Rutter is available today on Pixels & Company. There are 4 designs included and all super cute and easy to use. I cut one up on the Silhouette Cameo and taped the back. I think I will write a little journaling to the heart paper that I tucked in there, but for now I like the plain paper peeking out. I didn't even have a 3x4 pocket in this weeks layout so I decided to add it to a 4x6 piece of paper. Another week, another QR code. This one is of a little impromptu sing-along that happened when some friends came over. Obviously fueled by some wine, if you are brave enough to scan and watch the video you might want to turn down your volume first. I had lots of square photos again this week and used (the back side of last weeks) HSN 1 page protector on the left side and Design Q for the right side. Both of these page protectors came from the HSN exclusive "Just Add Color" Project Life kit. I used a piece of heart printed vellum for the center pocket with a sweet Studio Calico chipboard sticker. Since this will show through on next weeks layout I also will add another sticker of the same size of the back side. Your pages are so much fun. So many great things to look at without looking cluttered. this is gorgeous!! I must admit I so want bacon now!